Do you remember playing the beetle game as a child? With paper, pencil and a die you have the equipment necessary for a game of Beetles with your grandchildren. No scrounging in the games cupboard, no arguments over who uses which coloured counter and no cleaning up afterwards! Quick, fun and ideal for those times when you only have a few minutes to fill in. Even good as you wait together in the dental surgery or hairdresser’s if you have a die tucked into a corner of your purse. The rules are simple. 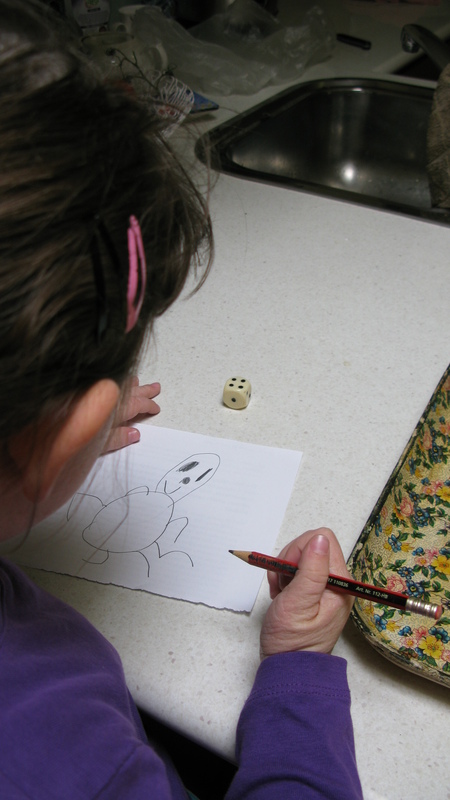 As each player throws the die the number shown represents which part of the beetle she can draw. Each person must throw a 6 to start as that represents the beetle’s body. Once the body is drawn the head (5), 6 legs (4 for each one), antennae (3 each) and eyes (2 for each) can be added. The first to complete a beetle is the winner. Dice games are good for building math concepts along with the social skills of learning to take turns and winning/losing gracefully.